As a professional home stager, Sandy Sullivan is an expert at transforming cluttered rooms into attractive houses ready for sale. If only reinventing her life were as easy as choosing the perfect paint color. She's eager to put her family's suburban Boston home on the market, to downsize, and to simplify her own life. But she must first deal with her foot-dragging husband and her grown son, who has moved back home after college to inhabit the basement "bat cave." After reading them the riot act, Sandy takes a job staging a boutique hotel in Atlanta recently acquired by her best friend's boyfriend. The good news is that she can spend time with her recently married daughter, Shannon, in Atlanta. The bad news is that Shannon finds herself heading to Boston for job training, leaving Sandy and her southern son-in-law, Chance, as reluctant roommates. If that's not complicated enough, Sandy begins to suspect that her best friend's boyfriend may be seeing another woman on the side. Filled with characters who are fresh and original, yet recognizable enough to live in your neighborhood - plus plenty of great tips and tricks for fixing up houses, and lives - this is a wise and witty story of letting go and moving on. 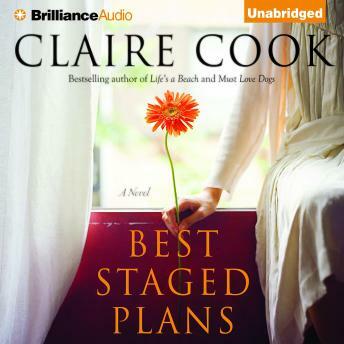 Best Staged Plans is Claire Cook at her most humorous and heartfelt.